Jimmy Rushing, Born James Andrew Rushing was born in Oklahoma City on August 26, 1903. He grew up in Oklahoma Cities’ African American community called the “Deep Deuce.” This was like Kansas Cities 18th and Vine district, the black cultural, and business center. Rushing’s religious parents were musicians and imposed music on Jimmy. His father played trumpet for the Knights of Pythias and his mother played piano and was a soloist in the church choir. Jimmy eventually became a piano playing, blues shouter, and jazz singer, but he started with violin at his father’s wish. Jimmy’s father was against him playing piano because it was “honky tonk” music, but his uncle Wesley Manning was a blues piano player that made decent money in the deep deuce’s red light district. This inspired Jimmy to make music a career, and his uncle helped teach him piano. His initial music studies began at Douglass Highschool. After graduation he spent a year at the nations oldest private African American college, Wilberforce University, In Wilberforce Ohio. He was the official house pianist at school functions and events. After only a year away at school he returned home to Oklahoma City. Mr. Rushing was considered a very social man, and a dapper dresser. He was often seen about town and entered many dancing contests. He was a good dancer and often won. Although he was a rounder man he was rather light on his feet. In 1923 he relocated to Los Angeles to pursue more job opportunities in the performance industry. While in Los Angeles he met and became friends with Jelly Roll Morton. He began to play parties and weddings, and made his vocalist debut with the Sunnyland Jazz Orchestra at the Quality Night Club. Celebrities and movie stars frequented this club. This led to more jobs in LA’s nightclubs, and another well-known venue The Jump Steady Club. He stayed in LA for a few years before returning to Oklahoma City. Back in Oklahoma he sang at night and slung hamburgers at his fathers hamburger joint. Ralph Ellison a writer from Oklahoma City once said that his voice could be heard blocks away, without him using any voice amplification. In 1927 Walter Page, Leader of the Band Walter Page’s Blue Devils, heard Jimmy sing in a Cabaret. Soon after hearing his powerful voice Page offered him a spot in his band. This would put him along side pianist William “Count” Basie, Trombonist and arranger Eddie Durham, trumpeter Oran ”Hot Lips” Page, and saxophonist Buster Smith, and Lester Young. Page stationed the band in Oklahoma City, and they became a successful territorial band and engaged in myriad territorial battle of the bands. 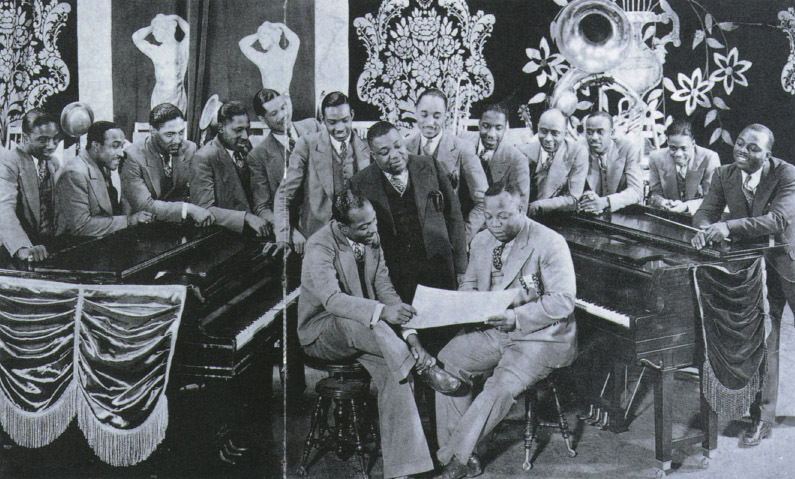 In 1929 Rushing along with other members of the band left and joined Benny Moten’s band. Moten’s Band was the most successful and prestigious of the territorial bands. Moten had a great reputation as bandleader. He was also considered to be a musical leader in Kansas City. Tom Pendergast was in charge during this time Kansas City. The city was filled with booze, gambling, nightclubs and prostitution. He first appeared with the Moten band in the 18th and Vine district December 13, 1929. 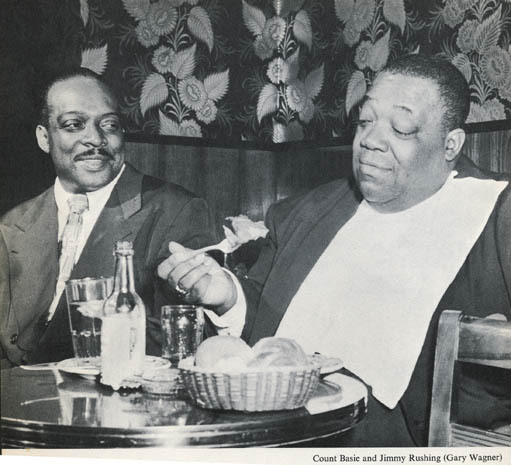 Bill Basie and Jimmy became good friends, and this relationship would continue after the Moten band. Moten Died tragically in routine tonsil surgery in April 1935. His brother Benny took over the band and proved to be an unfit leader as the band broke up only months later. Bill Basie then started a band with the members of the Moten band. From the very start of the Basie band in 1935, Jimmy Rushing was on board. Rushing was with Basie for over 15 years. Producer John Hammond put on a show at Carnegie Hall on December 23, 1938 “From Spirituals to Swing.” The concert was split in halves. The first half was black music’s African origins, gospel, blues and Dixieland. The second half was Basie’s Band including songs sung by Rushing. This was a historical event and they got to perform in the famous Carnegie hall. 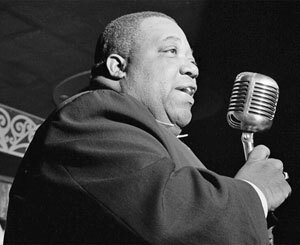 When the Basie band broke up in 1950 Rushing tried his hand at business but he missed the entertainment industry. Then he started his own group and appeared as a guest on a Duke Ellington track. He lived out the rest of his life appearing in films and TV shows highlighting influential jazz artists. Jimmy was Kansas City Jazz. He had the soul, the sound and the size to back it. His sound depicted the Kansas City jazz tradition, and his career helped develop a musical style. Mr 5 by 5 died on June 8th 1972. 2.Frank Driggs and Chuck Haddix, Kansas City Jazz: From Ragtime to Bebop – A History (New York: Oxford University Press, 2005), 59-61.